Make Pico de Gallo (sauce) first, by mixing all sauce ingredients together. Stir well and set aside. Heat a non-stick pan on medium heat and spray with a little olive oil. Place the wraps one at a time in the pan and brown lightly on each side. Remove from heat and lay each wrap on a plate. Mix lemon zest and yogurt together. 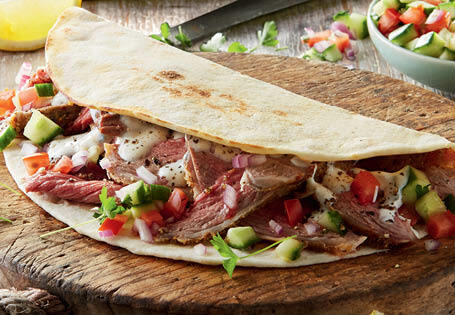 Place half of the sliced lamb on each wrap, leaving one side of each wrap empty. Top with the Pico de Gallo, dollop each wrap with yogurt mix. Sprinkle with a few fresh herb leaves, salt, fresh cracked pepper and a squeeze of lemon juice. Fold in half and serve immediately.